American Jews tend to be more highly educated and politically liberal than the U.S. public as a whole, as well as less religiously observant, at least by standard measures such as belief in God and self-reported rates of attendance at religious services. The U.S. Jewish population also is older than the general public and has fewer children. But within the U.S. Jewish community, one important subgroup clearly does not fit the picture of a relatively secular, liberal-leaning, aging population with small families. Unlike most other American Jews, Orthodox Jews tend to identify as Republicans and take conservative positions on social issues such as homosexuality. On average, they also are more religiously committed and much younger than other U.S. Jews, and they have bigger families. 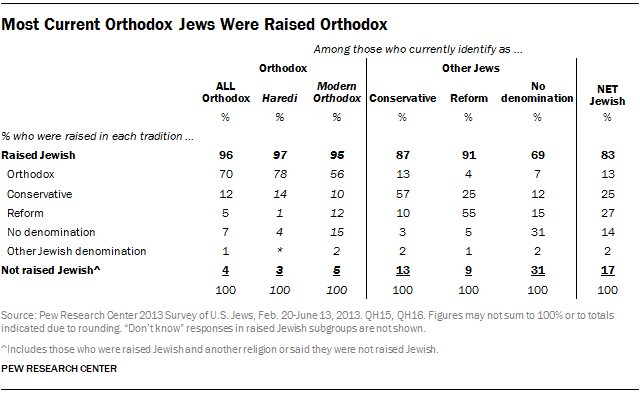 This report uses data from the 2013 Pew Research Center Survey of U.S. Jews to look closely at the Orthodox. Information about Orthodox Jews was scattered throughout the initial survey report, “A Portrait of Jewish Americans.” It has been brought together here and supplemented with additional statistical analysis and more detailed charts and tables. The 2013 survey found that Orthodox Jews make up about 10% of the estimated 5.3 million Jewish adults (ages 18 and older) in the United States.1 A survey is a snapshot in time that, by itself, cannot show growth in the size of a population. But a variety of demographic measures in the survey suggest that Orthodox Jews probably are growing, both in absolute number and as a percentage of the U.S. Jewish community. To begin with, the median age of Orthodox adults (40 years old) is fully a decade younger than the median age of other Jewish adults (52). Despite being younger, more than two-thirds of Orthodox adults are married (69%), compared with about half of other Jewish adults (49%), and the Orthodox are much more likely to have minor children living in their household. On average, the Orthodox get married younger and bear at least twice as many children as other Jews (4.1 vs. 1.7 children ever born to adults ages 40-59).2 And they are especially likely to have large families: Among those who have had children, nearly half (48%) of Orthodox Jews have four or more offspring, while just 9% of other Jewish parents have families of that size. Moreover, nearly all Orthodox Jewish parents (98%) say they are raising their children in the Jewish faith, compared with 78% of other Jewish parents. Orthodox Jews are much more likely than other Jews to have attended a Jewish day school, yeshiva or Jewish summer camp while growing up, and they are also more likely to send their children to these kinds of programs. If the Orthodox grow as a share of U.S. Jews, they gradually could shift the profile of American Jews in several areas, including religious beliefs and practices, social and political views and demographic characteristics. Generally speaking, people who describe themselves as Orthodox Jews follow traditional interpretations of Jewish law, or halakha, and 79% of the Orthodox say that observing Jewish law is essential to “what being Jewish means” to them, personally; just 13% of other U.S. Jews say the same. On numerous measures of religious belief and practice, Orthodox Jews display higher levels of religious commitment than do other Jews. Indeed, in a few ways, Orthodox Jews more closely resemble white evangelical Protestants than they resemble other U.S. Jews. For example, similarly large majorities of Orthodox Jews (83%) and white evangelicals (86%) say that religion is very important in their lives, while only about one-fifth of other Jewish Americans (20%) say the same. Roughly three-quarters of both Orthodox Jews (74%) and white evangelicals (75%) report that they attend religious services at least once a month. And eight-in-ten or more Orthodox Jews (84%) and white evangelicals (82%) say that Israel was given to the Jewish people by God – more than twice the share of other American Jews (35%) who express this belief. Other U.S. Jews lean heavily toward the Democratic Party, but the opposite is true of the Orthodox. 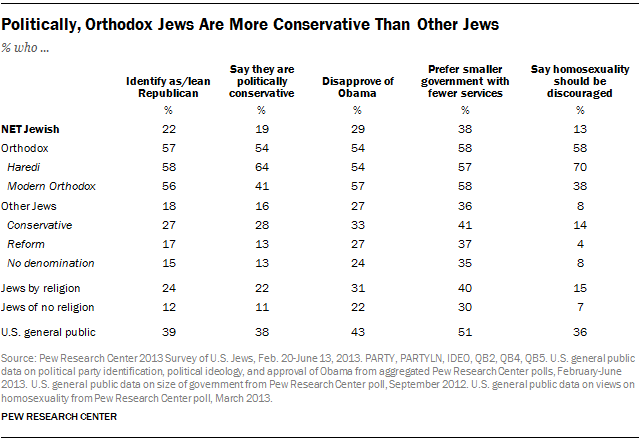 As of mid-2013, 57% of Orthodox Jews identified with the Republican Party or said they leaned toward the GOP. Orthodox Jews also tend to express more conservative views on issues such as homosexuality and the size of government; that is, they are more likely than other Jews to say that homosexuality should be discouraged and that they prefer a smaller government with fewer services to a bigger government with more services. The rest of this report details some of the key differences both between Orthodox Jewish groups and among Orthodox Jews overall and other American Jews. These two groups constitute, for the purposes of this analysis, the “net” Jewish population. 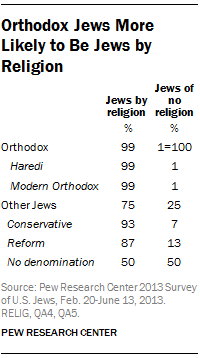 Virtually all Orthodox Jews (99%) are Jews by religion. To identify Orthodox Jews, the survey relied on two main questions. The first asked, “Thinking about Jewish religious denominations, do you consider yourself to be Conservative, Orthodox, Reform, something else or no particular denomination?” Those who self-identified as Orthodox were then asked a follow-up question: “Do you consider yourself to be Modern Orthodox, Hasidic, Yeshivish or some other type of Orthodox?” The Haredi (or Ultra-Orthodox) category includes Jews who come from at least two distinct traditions – the Hasidic tradition and the Yeshivish (or “Lithuanian”) tradition. How Were Today’s Orthodox Jewish Adults Raised? This report flips the lens: Among adults who currently identify as Orthodox Jews, how many were raised in the Orthodox tradition? And how many became Orthodox after having been raised as Conservative or Reform Jews, or even as non-Jews? Seven-in-ten adults who currently identify as Orthodox Jews (70%) were raised as Orthodox. 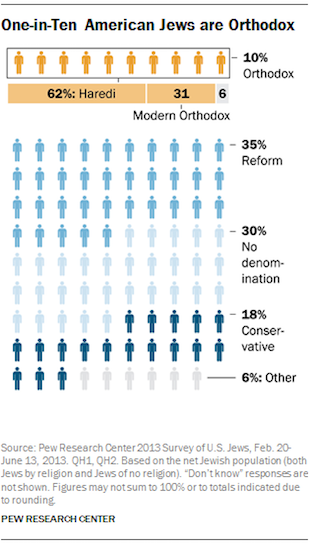 Upwards of one-in-ten Orthodox Jews (12%) say they were brought up in the Conservative movement, and 5% were raised as Reform Jews. An additional 8% say they were raised in the Jewish faith but in some other stream of American Judaism (such as Reconstructionist) or gave other answers, such as saying they were raised in a Sephardic Jewish tradition. By comparison, the other major streams or denominations of American Judaism have smaller shares of adults who were raised in those movements: 57% of adults who identify as Conservative Jews say they were raised in the Conservative movement, and 55% of Jews who identify as Reform were raised in the Reform movement. 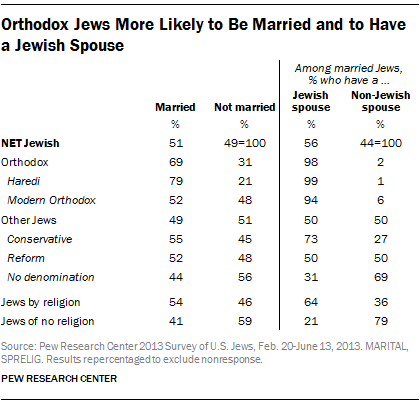 Compared with other Jews, Orthodox Jews are much more likely to be married. About seven-in-ten Orthodox Jews ages 18 and older (69%) are married, compared with 49% of other adult Jews. Haredi Jews are largely responsible for this gap; 79% of Haredi adults are married. About half of adults in the Modern Orthodox tradition (52%) are currently married, comparable to the shares of adults in the Conservative (55%) and Reform (52%) traditions. Nearly all Orthodox Jews who are married have Jewish spouses (98%), while fewer married Conservative and Reform Jews (73% and 50%, respectively) have Jewish spouses. Orthodox Jews not only are more likely to be married, but also are more likely to have gotten married before the age of 25.7 Roughly seven-in-ten currently married Orthodox Jews (68%) in the survey were married by age 24, compared with just 27% of other Jews. 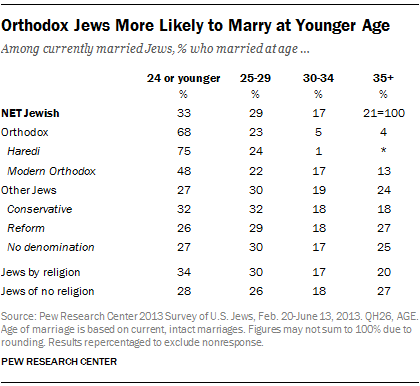 And while a quarter of currently married non-Orthodox Jews (24%) got married at age 35 or later, the vast majority of Orthodox Jews were married before age 35. With a median age of 40 (among adults), Orthodox Jews are younger than other Jews. Roughly a quarter of Orthodox Jewish adults (24%) are between the ages of 18 and 29, compared with 17% of Reform Jews and 13% of Conservative Jews. Moreover, only 12% of Orthodox Jews are 65 or older, while among other Jews, almost twice as many (22%) have reached the traditional retirement age. Again, Haredi Jews stand out; 32% of Haredi adults are between the ages of 18 and 29, compared with 9% of the Modern Orthodox. Nearly half of Haredi adults (46%) are in the 30-49 cohort, while only 6% are 65 or older. 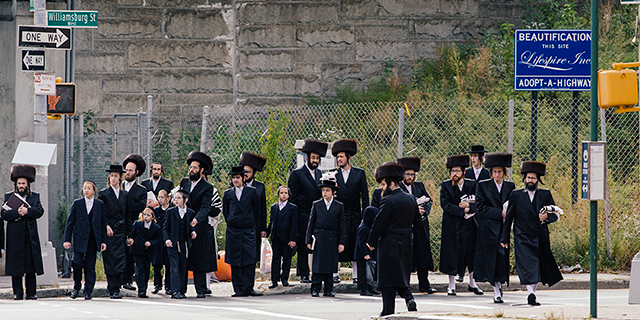 Orthodox Jews tend to have more children than other Jews. The 2013 Pew Research report noted that Orthodox Jewish respondents ages 40-59 have had an average of 4.1 children in their lifetime, compared with an average of 1.7 born to all other U.S. Jews in that age group (a measure known as “completed fertility”). Perhaps as a result of their higher rates of marriage, lower median ages and bigger families, Orthodox Jews also are far more likely to have minor children currently living in their household. About half of Orthodox adults have at least one child at home, and 19% have four children or more in the house. Haredi Jews are much more likely than the Modern Orthodox to have at least four children currently living at home (27% vs. 4%). By contrast, most Conservative and Reform Jews do not currently have any children living in their household (78% and 75%, respectively). Nearly all Orthodox Jewish parents who have at least one child under the age of 18 living in their household (98%) are raising those children Jewish. And an overwhelming majority of Conservative Jewish parents (93%) and Reform Jewish parents (90%) with at least one child at home say they are raising those children Jewish. Most Orthodox Jewish parents (81%) have a child enrolled in a Jewish day school or yeshiva, compared with 11% of other Jews. And Orthodox Jews are more than twice as likely as other Jews to enroll their children in some other organized Jewish youth program, such as Jewish day care, nursery school, youth group, day camp or sleepaway camp (69% vs 27%). While most Orthodox Jews who are raising minor children send those children to full-time Jewish schools or yeshivot, other Jews are more likely than Orthodox Jews to enroll their children in other part-time formal Jewish education programs that typically supplement a largely secular education, such as Hebrew school, congregational school or Sunday school (24% vs. 16%). Among adults, far more Orthodox Jews attended a yeshiva or Jewish day school when they were children than did other Jews. Roughly three-quarters of Orthodox Jews (73%) say they attended a full-time Jewish school when they were growing up, compared with 17% of other Jews. By contrast, Orthodox Jews are significantly less likely to have participated in the kind of part-time Jewish programs that typically supplement a largely secular education, such as Hebrew school or Sunday school, when they were children. Upwards of seven-in-ten Orthodox Jewish adults (72%) say that they became a bar or bat mitzvah when they were young, compared with 48% of other Jews.8 And 74% of Orthodox Jews attended an overnight Jewish summer camp while growing up; among other Jews, 34% went to such a camp. Haredi Jews are significantly more likely than Modern Orthodox Jews to report attending Jewish day school, becoming a bar/bat mitzvah or attending overnight Jewish summer camp, although majorities of adults in both groups say they had these experiences when they were children. Orthodox Jews – especially Haredi Jews – tend to receive less formal, secular education than do other Jews. A third of Orthodox Jewish adults have a high school education or less, compared with just 15% of other Jews. 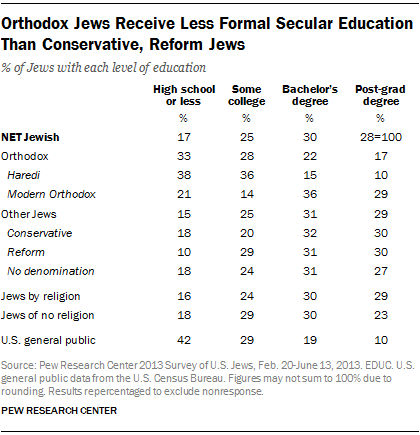 And 30% of both Conservative and Reform Jews have post-graduate university degrees, compared with 17% of Orthodox Jews. However, in terms of secular education, Modern Orthodox Jews are more similar to Conservative and Reform Jews than they are to Haredi Jews. Three-in-ten Modern Orthodox Jews (29%) have post-graduate degrees, and an additional 36% have bachelor’s degrees; among Haredi Jews, just 10% have post-graduate degrees, and an additional 15% have bachelor’s degrees. An overwhelming majority of American Haredi Jews (89%) live in the Northeast region of the country, including New York and New Jersey. 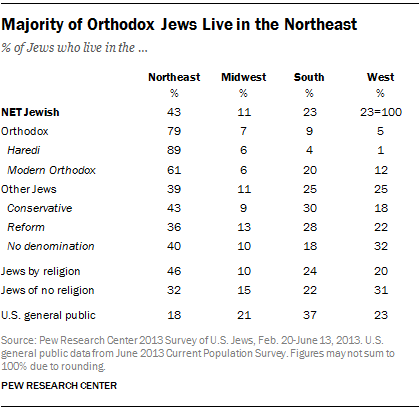 Most Modern Orthodox Jews (61%) also live in the Northeast, although roughly a third live in either the South (20%) or the West (12%). Other Jews, while still more heavily concentrated in the Northeast than the U.S. general public, are more evenly distributed across the country than Orthodox Jews. The Northeast is home to the biggest shares of Conservative (43%) and Reform (36%) Jews, but roughly three-in-ten members of each group live in the South (including Florida), and about one-in-five Conservative and Reform Jews live in the West. Orthodox Jews, especially Haredi Jews, tend to have close circles of friends consisting mostly or entirely of other Jews. This is less common among Conservative and Reform Jews. 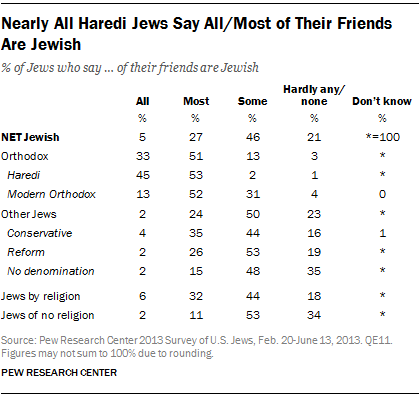 About eight-in-ten Orthodox Jews (84%) say that all or most of their friends are Jewish. By comparison, among other Jews, about a quarter (27%) say the same. A majority of non-Orthodox Jews in the U.S. say that at least some of their friends are Jewish, but 23% say that hardly any or none of their friends are Jewish. That is in stark contrast with the 1% of Haredi Jews and 4% of Modern Orthodox Jews who report that hardly any or none of their friends are Jewish. Virtually all Orthodox Jews in the survey say they have a strong sense of belonging to the Jewish people, while 73% of other Jews say the same. Similarly, more Orthodox Jews than other Jews say that being Jewish is very important to them and that they have a special responsibility to care for Jews in need. Followers of the major streams or denominations within U.S. Judaism are more similar when it comes to Jewish pride. Overwhelming majorities of both Orthodox Jews (98%) and other Jews (94%) say they are proud to be Jewish. There are, at most, only modest differences between Modern Orthodox Jews and Haredi Jews on these measures of Jewish identity and belonging. Among members of both groups, big majorities say that they have a strong sense of belonging to the Jewish people, that being Jewish is very important to them, that they have a special responsibility to care for Jews in need and that they are proud to be Jewish. 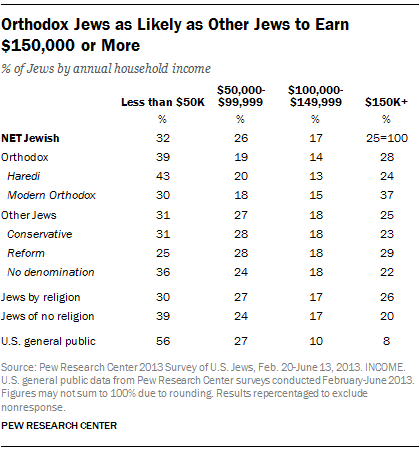 The 2013 survey finds that religion plays a far greater role in the lives of Orthodox Jews than it does for other Jews. 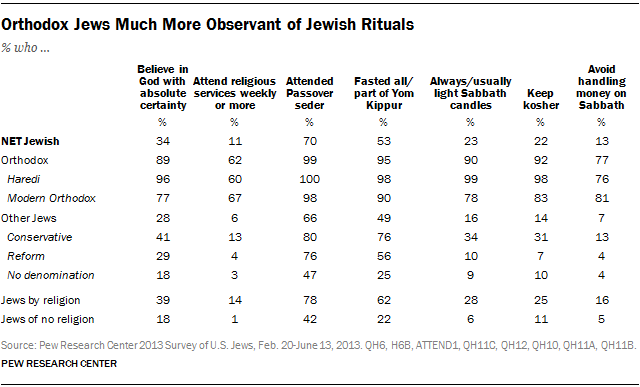 About eight-in-ten Orthodox Jews (83%) say religion is very important to them, compared with 20% of other Jews. Around the same time period, 56% of Americans overall said religion is very important in their life. Most Orthodox Jews say that being Jewish is either mainly a matter of religion (46%) or a matter of religion as well as of ancestry and/or culture (38%). A majority of other Jews say that being Jewish is mainly a matter of ancestry and/or culture (67%); only 11% say it is mainly a matter of religion. While Modern Orthodox and Haredi Jews are largely similar in their high levels of observance, lighting Sabbath candles and keeping kosher are more universal practices in Haredi homes. The 2013 survey also asked several questions about the Middle East peace process. It is important to bear in mind that opinions on this topic may have shifted since the survey was conducted due to events in the region (including the 2014 Israel-Gaza conflict and recent Israeli elections). As of 2013, however, there were significant differences between Orthodox Jews and other Jews in attitudes toward the prospects for peace. For example, Orthodox Jews were less than half as likely as other Jews to say that Israel and an independent Palestinian state can coexist peacefully. Non-Orthodox Jews also were much more likely than Orthodox Jews to say that building Jewish settlements in the West Bank hurts Israel’s security (47% vs. 16%). Again, the survey found differing viewpoints within Orthodox Judaism. Roughly three-quarters of Modern Orthodox Jews (73%) said in 2013 that the Israeli government was making a sincere effort to reach a peace settlement, compared with 53% of Haredi Jews who said the same. Compared with other U.S. Jews, Orthodox Jews are far more socially and politically conservative. When the survey was conducted in 2013, 57% of Orthodox Jews said they identified with or leaned toward the Republican Party. By contrast, just 18% of other Jews identified with or leaned toward the GOP. Orthodox Jews were also much more likely than other Jews to self-identify as politically conservative (54% vs. 16%). About six-in-ten Orthodox Jews (58%) say they would prefer a smaller government that provides fewer services over a bigger government providing more services, compared with 36% of other Jews who take the same position. Orthodox Jews also are far more likely than other Jews to say that homosexuality should be discouraged by society, with more Haredi Jews (70%) than Modern Orthodox Jews (38%) saying this.